Do you receive the CEY weekly Web-Letter? If so, you know this week we’re featuring independent designers who have self-published patterns that feature our yarns. If not, you can view our independent designer feature here and sign up for the Web-Letter here. CEY’s partnership with indie designers goes beyond our Web-Letter features. Our monthly pattern books include a mix of indie designs and those from our in-house designers (both of them). A few of us contribute to the books but can only find time to design during nights and weekends, so we follow the same process as the indie designers, except we hand-deliver our submissions. Tonia recently blogged about the long process every design in our collection goes through before we publish the final pattern. For indie designers, it starts with a design call from Susan. After the submission deadline, Susan selects the pieces that fit with our theme and we send yarn (and a deadline) to the designers we’re going to publish. The designers themselves usually knit the pieces, although I have also met people who enlist the knitting help of their friends and family to make sure their pieces are knit in time for our photoshoots. We are proud to support independent designers and showcase their talents. The varied design perspectives they add to our in our pattern books ensures there are patterns for every skill level and type of knitter. 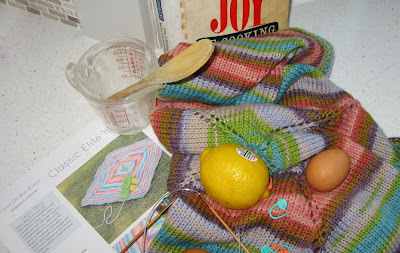 Knitting/crocheting patterns have a lot in common with recipes. They both tell you how to create a wonderful product with your own two hands. But both have downfalls if you don’t prepare properly. And we’ve all been there. First piece of advice? Read the pattern/recipe. So many people don’t do this and end up in trouble. Run out of eggs in the middle of your cooking? Don’t have the proper tools (don’t know what the proper tools look like)? Do you have to stop to figure out how to do something (tempering eggs anyone?) All this can affect your dish and your project. Isn’t it better to read through before you start so you can have all the tools you need at hand and know how to use them? Works in cooking, works in knitting. Read the pattern through before you pick up needles. You’ll find out what kind of needles you need (circulars, dpns), what your gauge needs to be, what the pattern is, and give yourself an opportunity to learn the pattern if unfamiliar (brioche? what’s brioche?) Look at the sizing and determine what size you want to make, then circle or highlight that size as you read through the pattern. Read it like a book. If you take the time to read it through, there won’t be any surprises as you knit and you’ll have a great FO at the end. And maybe some cookies to munch as you knit. Today's post is from Talitha Kuomi, a Massachusetts-based designer that CEY has had the good fortune of working with for the last few years. 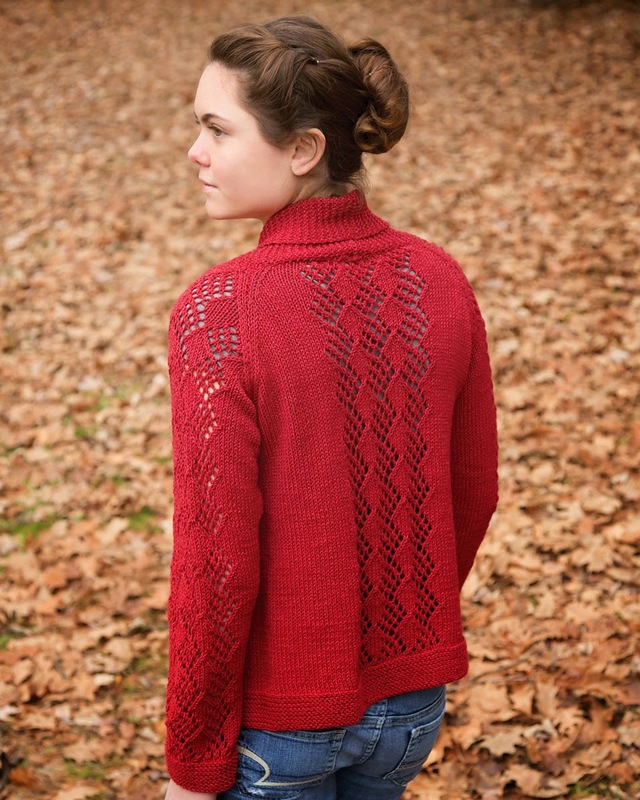 Her most recent design for CEY is Sydney, knit in brand new Tiverton Tweed. To learn more about Tal, visit her website www.talithakuomi.com, view her designs on Ravelry and read more about Tal's design process in this post on the CEY blog. Tweed, to me, is a chameleon. It makes me think of snooker halls (think American pool halls), potatoes fresh from the field and the smell of coal hanging heavy in the misty air. That’s odd, right? But the year I lived in the riverside town of Drogheda, Ireland was full of all of these. Tweed is a staple there. I wore a tweed coat, I knit in tweed flecked wools, and I passed countless tweed caps on my daily walk to town. When CEY created Tiverton Tweed, I was excited to work with it. My heart holds so many different memories of tweed, I wanted to design something that could be different things to different people, too. Instead of starting by sketching this time, I wrote scribbled down phrases and adjectives trying to capture the overriding feeling of safety and comfort that tweed was to me the year I was so far from things that were familiar and dear to me. 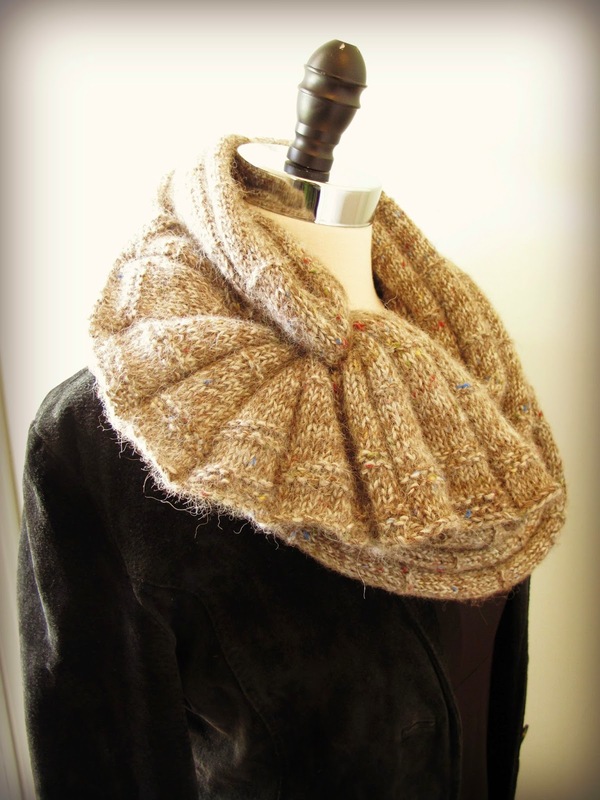 Written lines about ‘keeping the raw chill in the air at bay’ and ‘staving off the deep ache of homesickness’ became this textured scarf/cowl called Sydney. 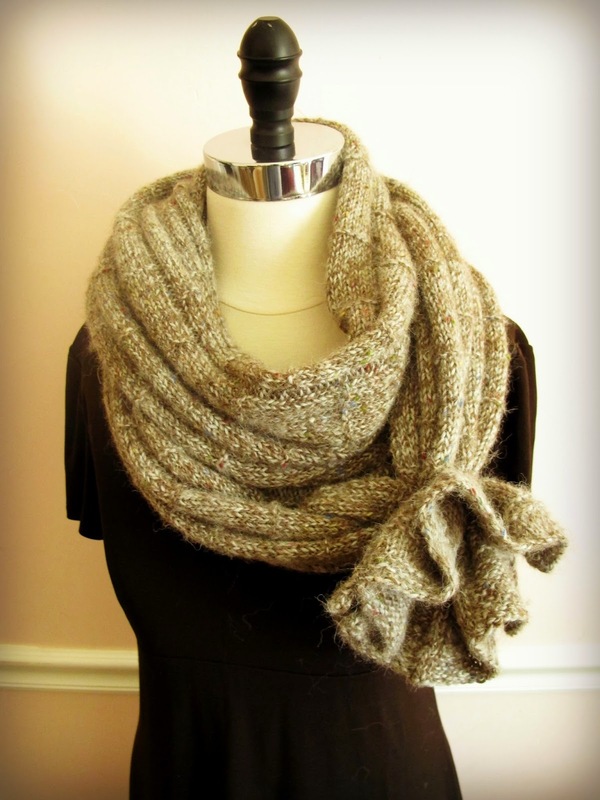 A slight modification is to wrap the scarf around your neck one and a half times. 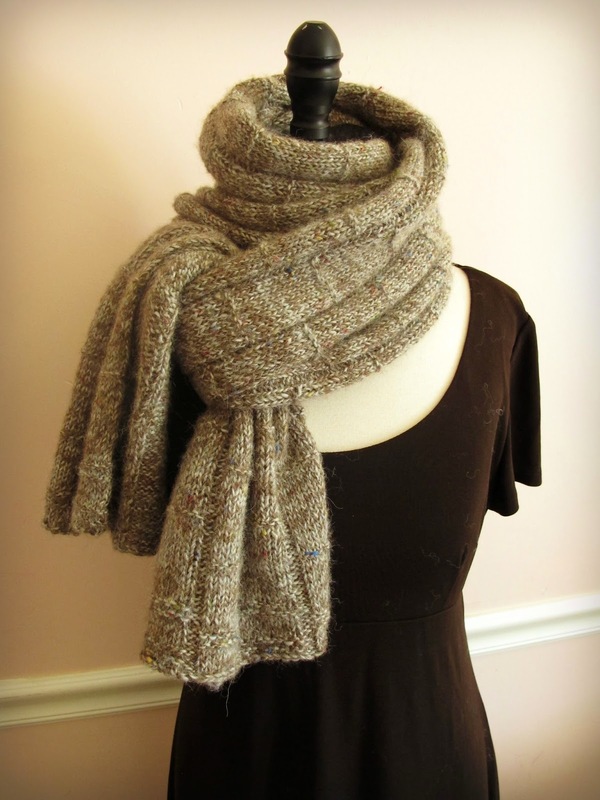 Use a shawl pin to secure one end to the center of the scarf, while tucking the other end inside the loop. Adding a simple I-cord opens up other possibilities. With the ends lain flat, and overlapped by a few inches, and tied together it’s a cowl. With the ends pulled to the front and allowed to hang, you get a funky, flower-like bloom. With the ends smoothed flat, dramatic little flares are created that add interest and texture to the cowl. I like it with the flares worn asymmetrically in front. With the flares slid around to the center back, they become a surprise. From the front it still looks like a regular double wrapped cowl. I’m sure there are more ways for Sydney to be worn. 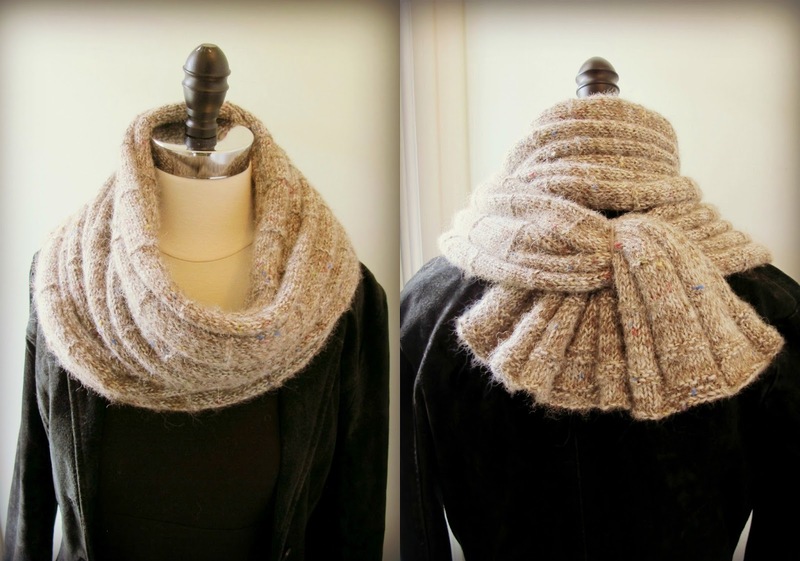 I saw knitters last weekend at a local fiber fest wearing their scarves in so many clever ways. These are just the ones that came to my mind, along with the warm memories that the tweed stirs in my heart. Love what you see? Stay tuned! Talitha has been busy designing a collection in collaboration with CEY that will debut in January. We can't wait share more as Tal's book nears publication. Have you ever wondered how a knitting pattern comes to be published? It’s a lengthy process! For Classic Elite Yarns, it all starts with a design team meeting. They get together to discuss a theme for the collection, which yarns to feature, and the overall “feel” for a book. Each designer then goes off to create! Sketching; swatching; researching; designing. They meet again and choose from all the ideas, and a plan emerges. 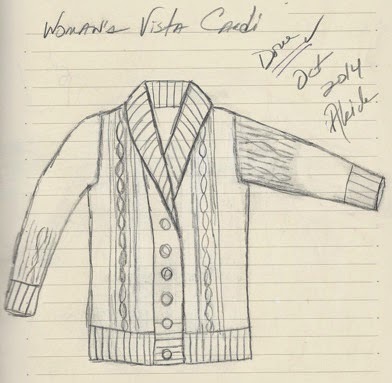 Once the collection is determined, the individual designers write draft patterns, which are then passed along to sample knitters, who take the preliminary work and make it into a real-live completed garment or accessory. Assigning draft patterns to sample knitters is part of the creative process too; some sample knitters are better at lace, some prefer complicated patterns, others are better at wool instead of cottons, and so forth. And each knitter is part of the team, working closely with the designer to work out any “bugs” in the design as it goes from concept to final product. CEY has a lot of great sample knitters. While the knitting is happening, planning for the photoshoot is also underway, which is Susan’s job. She coordinates all the people involved, picks the models’ wardrobes, and finds the perfect location. Then it’s photo shoot day! But back to the pattern’s instructions: once the designer finalizes her work, the instructions, schematics, and charts all go to technical editing. That’s where more of the magic happens: ensuring there are no math errors; making sure the language is accurate and easy to understand; putting all the pieces together. Each set of instructions goes from tech editing, to proofing – usually twice. We want to make sure there aren’t any errors! 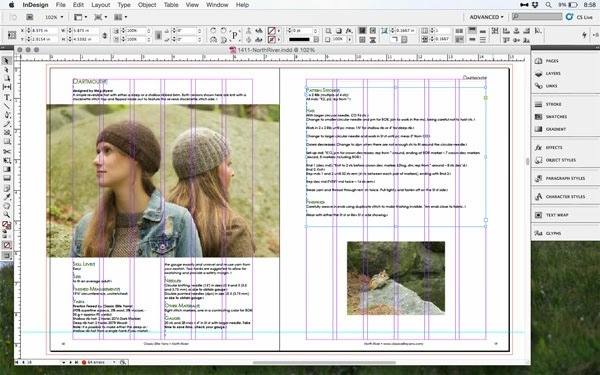 With instructions ready to go and photography completed, the patterns are put together into one cohesive collection – and that’s done via desktop publishing! The layout takes a lot of thought – it’s a little bit like putting together a jigsaw puzzle: all the pieces have to fit. More proofing, dotting all the I’s and crossing all the T’s. Now to the printer. 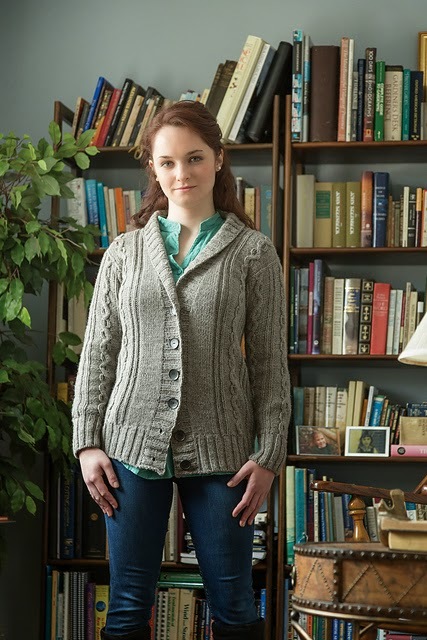 Most importantly, when it’s all done, each pattern and its collection goes to shops and to knitters as it begins its next life – as inspiration and a roadmap for each knitter as she dreams of what the piece will look like when it comes off of her needles – or his. Woman, man kid, senior: we’re just happy when knitters are happy with their end result! Susan Mills is CEY's Creative Director and also our most prolific designer. 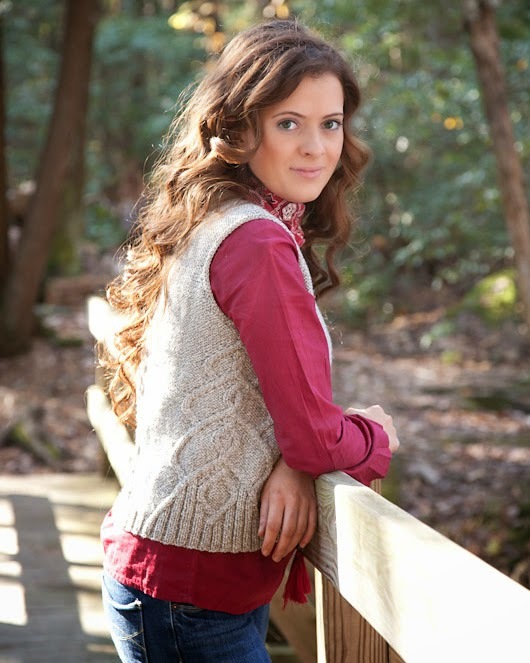 After adding designs from the new North River collection to Ravelry, I noticed she had 505* patterns in her portfolio. To mark this milestone, I asked her five questions about designing. What was your first design? 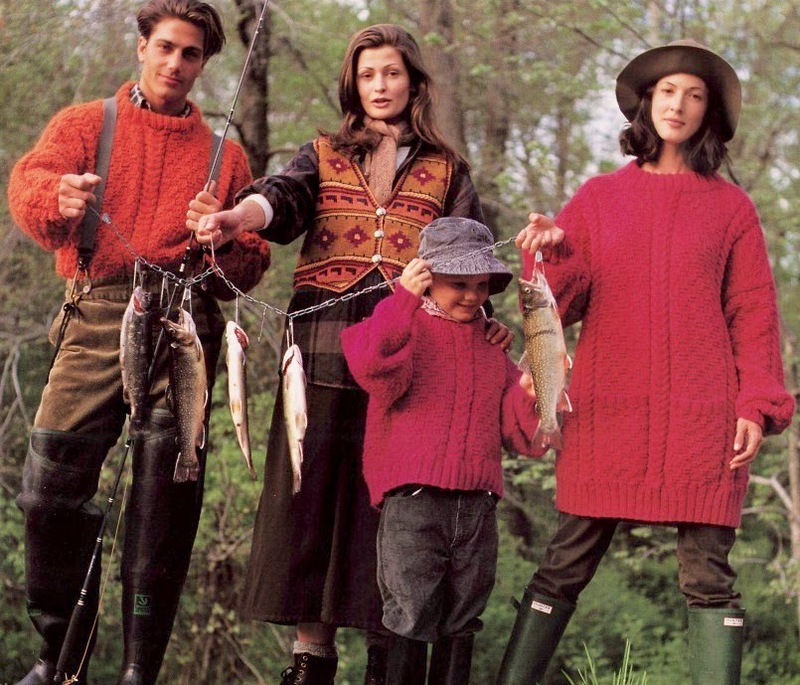 My first published design was pattern 437 Catch Of The Day for Classic Elite in 1993. 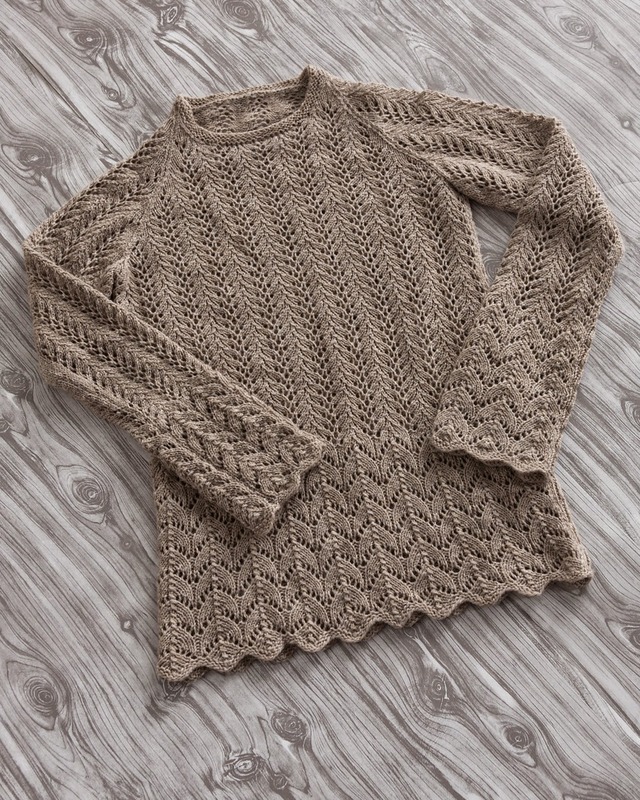 A family of pullovers in a basketweave stitch with cables. What is your favorite stitch or technique to use in designs? My favorite stitch or technique changes all the time but I always love colorwork, and I never get tired of Garter stitch. Right now I've been thinking and swatching cables. Your most popular design is Molly – the Liberty Wool scarf knit with short rows – why do you think it struck a chord with knitters? I think knitters like the ruffle-y edged effect without casting on or increasing to a hundreds of stitches. The 4 row repeat makes it easy to memorize and it's a great knit for self striping yarns like Liberty Wool. Do you have a favorite design? What are your 5 favorite CEY yarns and why? 1. Mohawk Wool – my new favorite yarn – has a wonderfully soft wooly hand with great stitch definition. 2. Fresco, for colorwork. The color range is great and the angora haze blends the colors and makes your tension look perfect (even when it isn't). 3. La Gran because I love how fast it works up, how warm and lightweight it is and how great mohair takes color. I definitely need to knit myself a new La Gran sweater this winter. 4. 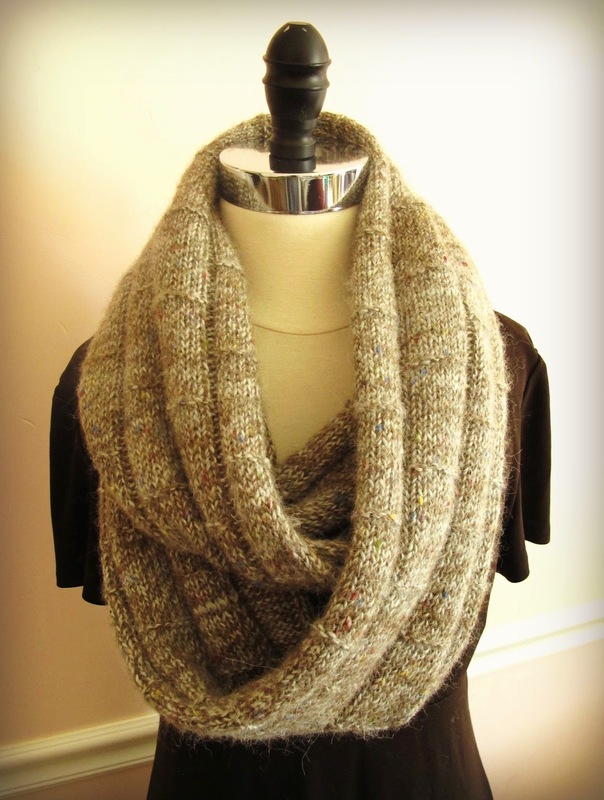 Alpaca Sox – my favorite yarn for scarves and wraps. 5. Soft Linen – I love the unique blend of fibers for colorwork and texture. *make that 506 with the addition of this week's Web-Letter: a free mesh scarf design in brand new Tiverton Tweed! Have questions or comments for CEY? We would love to hear from you! Email us at blog@classiceliteyarns.com.